Last Halloween, I needed to come up with some sweet treats for an impromptu little party that we had. I'm not much of a baker and I'm really impatient with cooking too so whatever ideas I came up with had to be quick and easy to create. The spider theme seemed like a good choice to go with for Halloween since pretty much everyone associates these with the spook-time season. So I came up with an idea that involved just a little amount of work and looked fun on the day. Since I was in a bit of a hurry, I just made up some plain little vanilla sponge cakes, popped them into bright orange cases and added my chocolate web designs on top. If I was doing this project again, I'd probably cheat and buy some pre-frosted and iced cupcakes to stick the toppers to since that would save even more time. 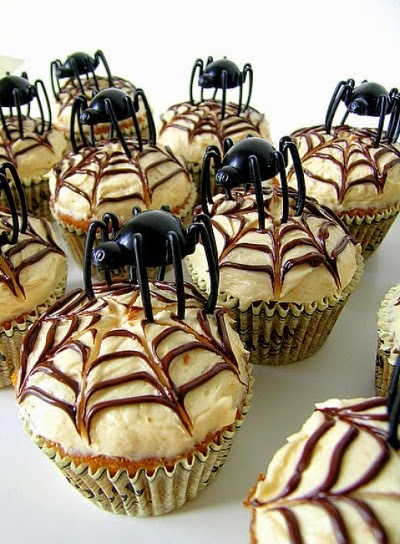 Ideas and Inspiration for Easy Spider Cupcakes for Halloween, Just Perfect for Last Minute Makes for Spooky Parties! Confession! I'm not much of a baker. I like to bake but I don't like kitchen projects that take too long to make, use too many ingredients and that are too difficult to understand. I want to make nice looking items without all the stress. 🎃 All you need to do is melt some chocolate and draw out some webs onto parchment paper. 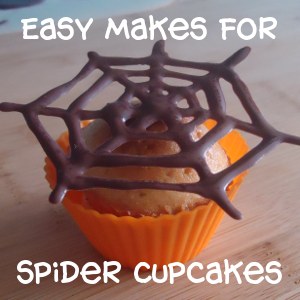 I explain exactly how you do this here: Step by Step Tutorial on Making Spiderweb Chocolate Toppers. I'm thinking that they would rather good placed on top of a rather eerie green frosting which you'd see under the web. 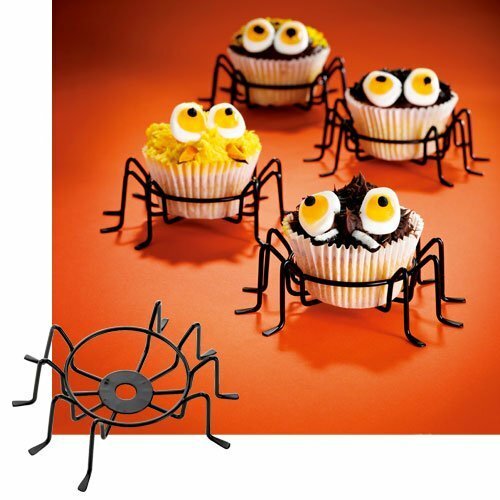 One way to incorporate the spider and arachnid theme into your Halloween baking is to make some easy chocolate web toppers which you can use on the top of your cakes as edible decorations. You don't even need to bake your own cupcakes with this one. 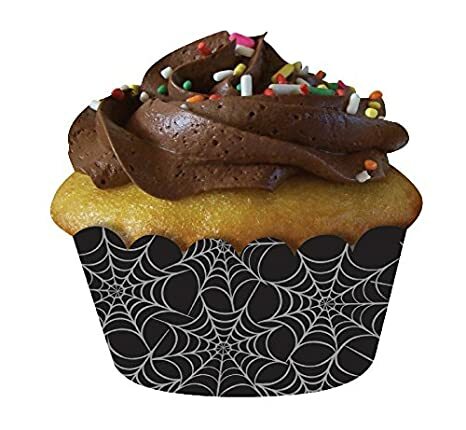 Just go and buy some pre-made cupcakes and pop them into some cute liners or Halloween baking cups in a suitable color like pumpkin orange, midnight black or a frightful pattern. Then make the toppers and add them on top, voila! Not too hard. 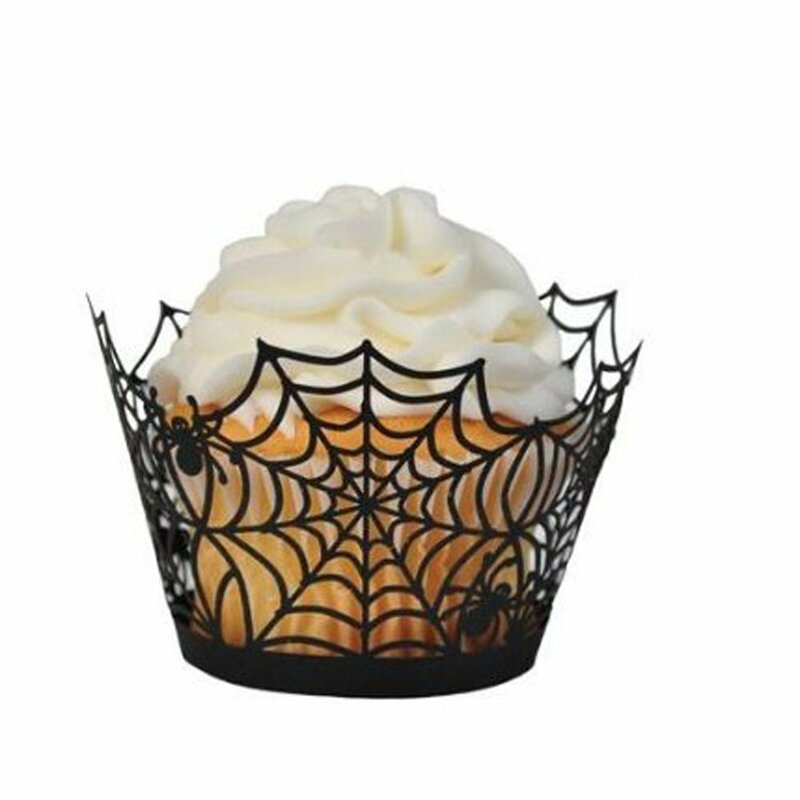 Weave up your own batch of themed spider cupcakes this Halloween by drawing out your own design with either melted chocolate or soft icing. Step 2: If you have made the cupcakes yourself, then let them have time to properly cool down before you decorate them otherwise the frosting will simply start to run and slide off. Step 3: The brilliant photo which provides inspiration here uses a vanilla buttercream topping but I thought that the combination of a chocolate buttercream with some ghostly white icing detail to create the spider web would look good as well. You can do it either way you please but you need a good contrast of colors between the web and the color of the frosting. Whip up some frosting. Here's a chocolate buttercream recipe that I use. Step 4: Use a small spatula or a blunt knife to spread the sweet buttercream generously on to the top of each little cake. You'll need to smooth this out with the back of a spoon so you can ice your web detail on top. Step 5: Prepare or buy a tube of fine white icing with a thin or fine nozzle. Draw out 4 or 5 small circles all inside each other on the top of each cake. You're going for a look of tree rings on the inside of a stump. You'll see the very technique with a video presented below. Step 6: Use a toothpick to mark a straight line from the center of all the circles and down towards the edge of the cupcake. Repeat to make several lines which start in the middle and end up working their way around the biggest circle. 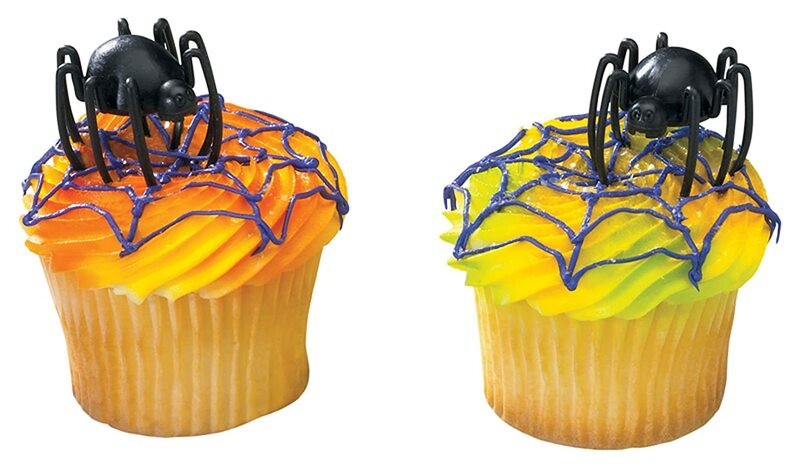 You'll end up with a spiderweb shape on the top of your cupcake. You can view this spiderweb icing process on Youtube at approx 2:48 mins into video which is shown below. 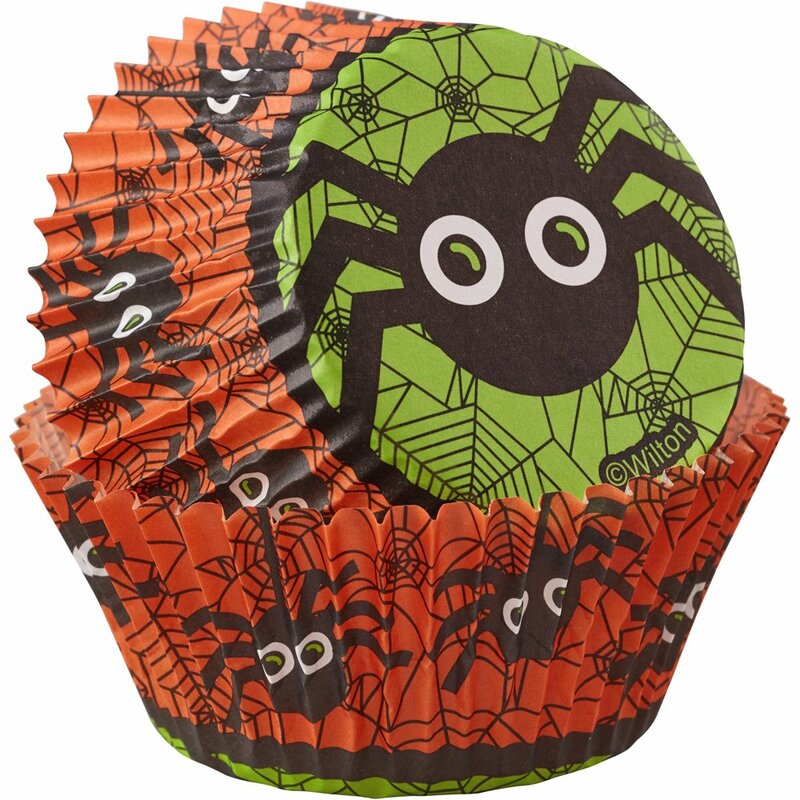 Step 7: Place a pretend spider or spider cupcake topper in the middle of each cupcake. If you put anything that isn't edible on your cupcakes, do make this clear to whoever is eating them. Step 8: Finish off with a Halloween themed cupcake wrapper. These designs are super quick to make, especially if you just buy some ready made chocolate cupcakes and then add on the eyes and legs! This is very easy for children to do so I am thinking of having a go at this one with my young daughter for the next Halloween. Step 1: Make up or buy as many chocolate cupcakes as you need. There is a recipe provided in the previous decorating idea that you can use. I'd be tempted to just buy them ready-made and frosted to make the process easier! Step 2: If you're baking, ensure that you let the cakes properly cool before you start in the decorating. Step 3: Mix up a nice chocolate buttercream recipe for the topping. Use the recipe provided for the previous instructions if you need one. Step 4: Spread out the sweet chocolate buttercream on top of each little cake. I like to have quite a thick amount that you can taste but you can use the thickness you prefer to eat. A small spatula or a blunt knife is ideal for frosting the cakes. Step 5: To get the look of a particularly hairy spider like a tarantula, you'll need to cover the topping with fine chocolate sprinkles or shavings. This is quite easy to do if you put your sprinkles or gratings into a wide bowl. Now turn each cake upside down and press down lightly into the bowl until the top is covered. Step 6: Get two red or green jelly beans to use on top of your cakes so they look like evil spider eyes. Step 7: Place 8 licorice twists or laces around the sides of the cupcake to give the appearance of long spider legs. If the idea of long, dangling legs freaks you out then make short, stubby legs instead that just stick out a little way from the cake. 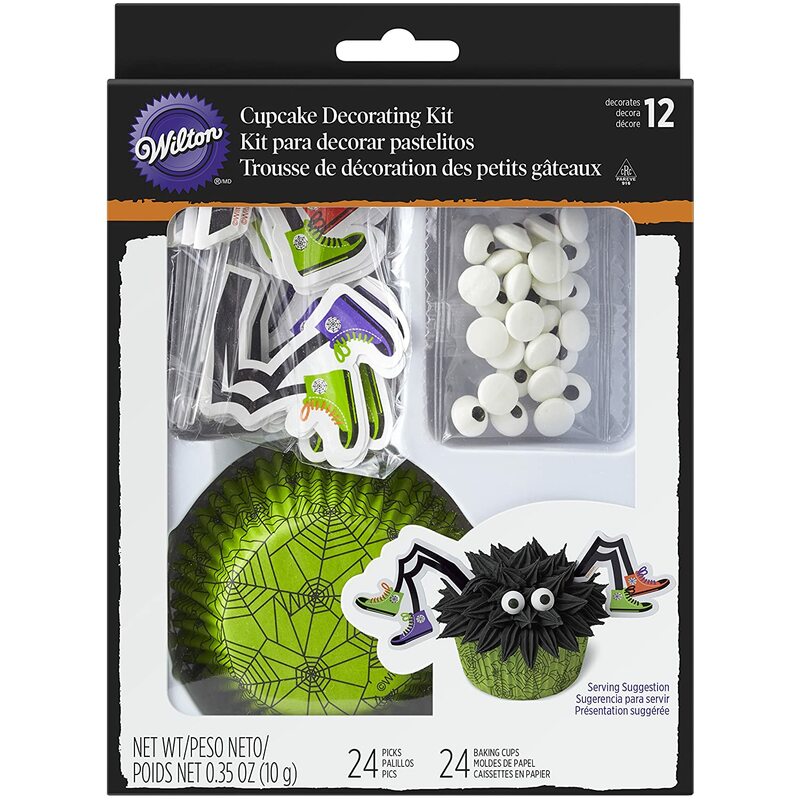 Step 8: Now complete your fun designs by placing them into Halloween colored or themed cupcake wrappers. Another alternative is to make some toppers or cupcake decorations that are not edible. A very easy way to do this, and one that kids can easily join in with too, is to make fused bead webs. 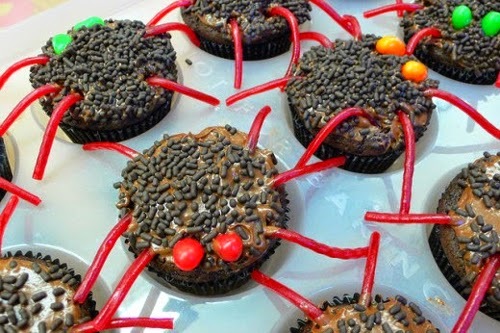 Of course, these make a fun theme for the bewitching season but there is no reason why they cannot also be adapted and used to create some birthday bug cakes for young arachnid fans. And you can change up the color of the chocolate by using colored candy melts. Have fun if you're celebrating the occasion. I hope you've enjoyed reading my justhalloweencrafts page today, thanks for your visit. You can tell me about your quick bakes for October 31st below in the comments.